Noooooooooo Hostess Cupcakes anymore?!!!! Just heard David Letterman say Hostess Brands, the makers of Twinkies and Ding Dongs, filed for bankrupty. Seems people want healthier products. I'm worried about all the staff that might lose their jobs. 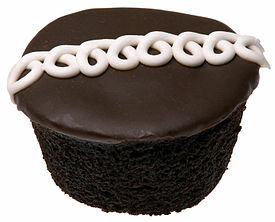 In an effort to help those people, I suggest all my family and friends in Canada buy up and send me as many Hostess Cupcakes boxes as you can. I of course won't eat any of them myself but will distribute them amongst the Aussies here so they can experience that creamy centre. It's helping everyone, really.